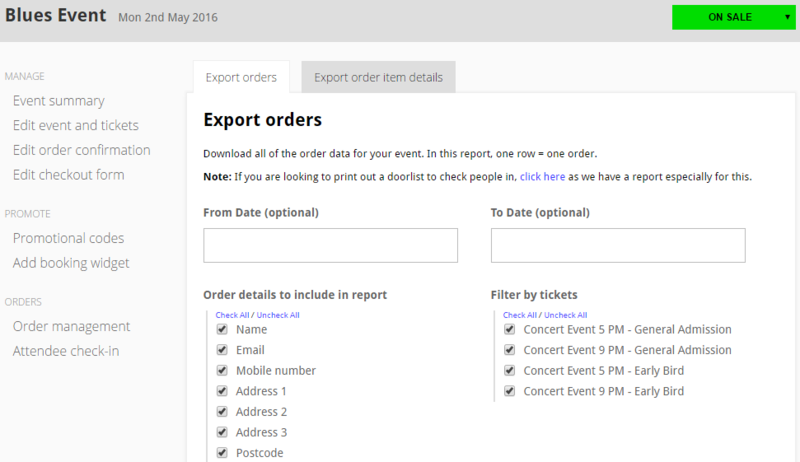 Exporting customer data allows you to download all of the order details for a particular event as a CSV file. This includes customer contact details and is useful for creating things like mailing lists. To export customer data, first navigate to the event containing the data you want to export and then click the ‘Order management’ tab on the left hand side. Finally, click the ‘Export orders’ button. Check or uncheck the boxes to choose which details you want in your exported document. If you only want the details for customers who purchased certain ticket types for example, tick the relevant tickets under the “Filter by tickets” heading. Click ‘Export data’ and then ‘Click here to export your customer data’. Your data will be downloaded as a CSV file which can be imported to other programs, or easily viewed in common applications such as Notepad or Microsoft Excel.